There is a quasi-philosophical disagreement underlying the steady digitisation of literature. A radical disagreement about what digital books really are. In a strange manner this dispute parallels the controversy between nominalists and realists in medieval scholastic philosophy about the status of universals (properties, numbers, virtues etc). Texts in the twenty-first century take the place of properties in the fourteenth. Are books more than texts, are texts more than digital file formats? Are these abstract concepts: “red”, “thirteen”, “chastity” real entities or are they simply instances and constructs based on our experience of coloured objects, groups of cakes and the people we meet? The nominalists denied the reality of these abstractions and the realists retaliated. Blood was shed. Now we find the digerati divided over the question whether a book is really more than a text; since the ebook nominalists, finding meaning in sentences and texts and not much else, would be be happy with books digitised as texts (preferably in the ePub standard) and the realists say that a book is much more than its text and that the pagination matters, the layout matters, the entirety of the book matters, the references and the citations to the book matter, and of course the illustrations matter; therefore in pursuit of realism, digital systems should virtualise the whole book, not just its text. While Project Gutenberg is at one end of the spectrum (nominalists carefully proof-reading and hunkered down in ASCII or XML), Google with its Book Search digitisation project is at the realist edge — some would say ‘hyper-realist’ in its acceptance of blank endpapers and leather bindings, all part of the ‘real book’ as represented in a Google database. Google probably would, if it could, encode the sensory aura of historic books, the vinegar that comes from cholera-touched books. But the modern predicament over books as texts, or books as virtual objects, is complicated by a dimension of uncertainty over the appropriateness of treating books as a collective whole as parts of a library and a literature, or of digitizing them one at a time as individual atoms; perhaps, in some cases, with unique and unusual bibliographic or structural properties. Digital nominalists are governed by a standard of simplicity and hold that a text is a text, is a text. 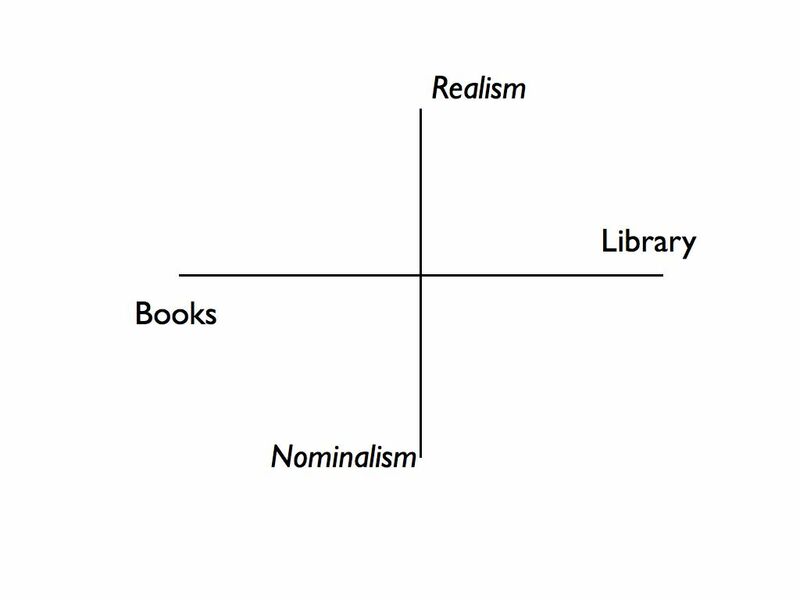 But some nominalists are atomic, whilst others favour a more holistic and uniform approach, in the interests of creating a library or a reading platform, in which all books can be searched and individual books isolated as readable downloads. Correspondingly, on the ‘realist’ side sits Google with its holistic and scalable method, Google’s whole strategy for digitizing books has been based on an assumption that all books should be accessed, searched and distributed through a single canonical library. Amazon, which has in most respects taken a ‘nominalist’ approach to the distribution of eBooks, it doesn’t do ePub but its proprietary format ‘AZW’ is just another ASCII encoding standard, has also embraced a ‘holistic’ attitude. Amazon offers its customers global searching of the Amazon archive and encourages users to build up a collection, a mini-library of eBooks on their Kindle. Amazon, just as much as Google, would like to have a scalable and totalitarian solution to the whole of published literature. All Kindle titles are atoms in the same collective, distinguished by the fact that they can be sampled or acquired from Amazon, one book at a time as the consumer dictates and purchases. 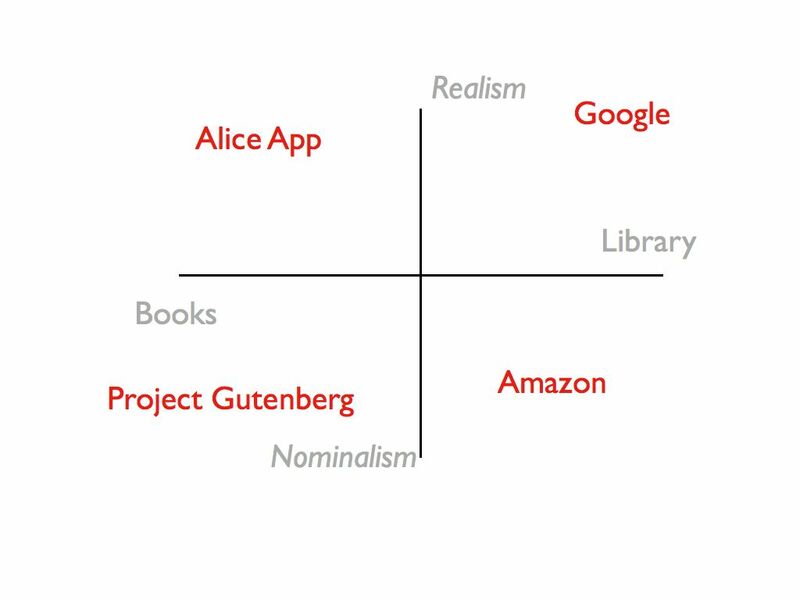 What approach to digital books heads to the top left quadrant of this matrix? Why, apps of course. If we think of books as apps, they do have a reality and concreteness which exceeds the flatness of the mere ASCII text, but the book as app is also highly individual. Perhaps a paradigm of this approach is the Atomic Antelope Alice App which has caused such a stir. The inventors of the Alice book found an intriguing way of applying ‘physics’, acceleration and gravity, to the Teniel illustrations in the Alice book. This is obviously a very special and un-generalisable treatment of a classic work, but as an app it is a brilliant proposition. Apps can afford to be sui generis since they stand on their own, and if this gives cataloguers and librarians a headache, too bad. The Exact Editions book and magazine apps are also in this segment of the diagram. It is, I would suggest, the potential inventiveness and the unpredictable future of the book as an application that has the most intriguing potential for the future of digital books (and libraries). If digital books do something completely novel and free-standing, something unprecedented in the world of print books, it will be because they are also software applications and can in that way assume a digital reality which exceeds our expectations of the traditional text.